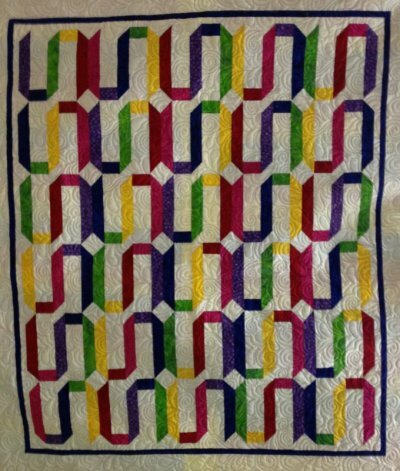 Join us for summer fun as we play ball with Major League Quilting, a multi-shop online event that is all about seeing beautiful quilts and having lots of fun! Each shop selects one quilt to compete against the other participating shop quilts and you vote to determine the winner. Go to www.majorleaguequilting.com to register to vote. Rainbow Ribbons is easy to piece and creates a spectacular finished product. We have kitted this luscious quilt with two background options, either the white background as shown above or with a black background as shown below.